Playa Ritual Hair Oil: This oil is really light in texture, yet only the tiniest amount is needed to tame frizziness or flyaway hairs. I especially love to use this on my hair when I am letting it air dry using Playa Endless Summer Spray for a textured, beachy look. It can be used on damp or dry hair and the pipette is perfect for preventing too much product being dispensed. Moroccanoil Treatment: The classic oil that most people have tried. Infused with argan oil, this product nourishes the hair, assists detangling, smooths and adds shine. I adore this oil but I find that I cannot use it every time I wash my hair or I am left with product build up that ends up weighing my hair down. Those with thicker hair than mine wouldn't have this problem. The scent is really beautiful - warm and comforting. It can be used as a pre-shampoo treatment or on damp or dry hair. The large bottle has a pump but this little travel bottle doesn't but because it is small, I can monitor how much I dispense. Grow Gorgeous Shine Serum: Although this is called a serum, it has an oil texture. As with all Grow Gorgeous products, the scent is divine - lightly vanilla-esque and warm. I apply a few drops to towel-dried hair and it really makes my hair so shiny and glossy - more than any of the other oils in this post. It doesn't feel heavy in the hair and doesn't make it greasy - an all round brilliant product. Ouai Rose Hair & Body Oil: This smells very like Jo Malone Peony & Blush Suede perfume - a very sophisticated rose scent and I love it! Because it is multi-purpose and is housed in a plastic bottle, this was perfect to bring on holiday earlier this month because I could use it on both my hair and any dry areas on my body. It is light in texture but packs a mighty punch in terms of the moisture it gives. A small pump of this is enough for my below shoulder-length hair and I like to apply it before blow-drying my hair to protect it but also add moisture, leaving it strong, silky and smelling beautiful. 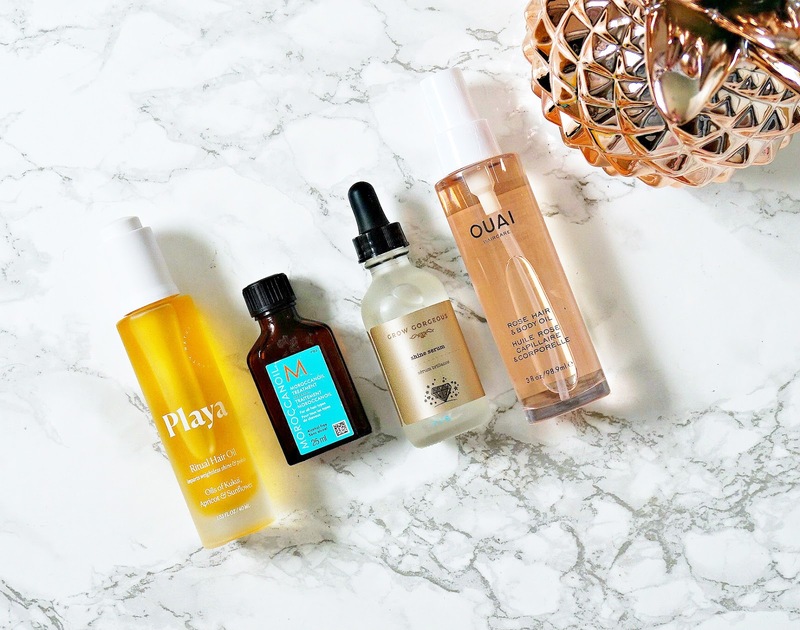 Do you use any of these oils? What's your favourite oil? I'd love to hear! All products are bought by me, unless otherwise stated. The Playa and Grow Gorgeous Oils were kindly sent to me. Opinion is always my own.